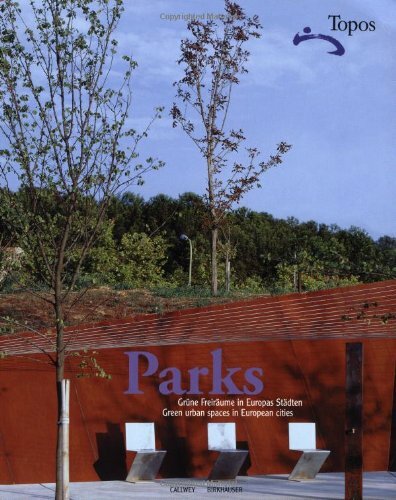 Short review: "Parks: Green Urban Spaces in European Cities"
By "Topos - European Landscape Magazine"
“Parks: Green Urban Spaces in European Cities” is the latest themed collection of previously published articles drawn from the past 10 years of Topos magazine offering readers the chance to access articles long out of print or hard to find. As in the last collection, the articles range from theory and historical discussion, to presentation and critique of built work and are heavily illustrated. French, German and Dutch writers contribute the bulk of the theoretical writing, presenting a balanced and forward-looking vision of the role open-space has to play in their respective countries. Built works are drawn from a somewhat larger area and include the usual suspects: Parc Citroën; Parc Villette; Duisburg Nord and the Kröller-Müller alongside newer projects such as Thames Barrier Park and the new Botanical Gardens of Barcelona. Happily, the generally little-known ‘Gardens of the World’ project by Kathryn Gustafson is presented, despite its position in semi-rural France. Situated in the Dordogne outside Terrasson-Lavilledieu, the park is briefly but eloquently described by Gustafson herself and supported with beautiful site plans, sections and photographs. The only other practitioner describing their own work is Giles Clement who carefully and thoughtfully discusses identity and signature in landscape design through a detailed analysis of his Serial Gardens within Parc Citroën. His comprehensive presentation of planting plans, plant lists and photographs alongside the sensitive underlying landscape theory is one of the strongest pieces in the book and perhaps worth its purchase alone. The links above are affiliate links and sales through them may benefit this site. ← Folding landscapes – defining a new language of surface?